The Trolley is ferrying folks to the many locations. Giuliano photos. 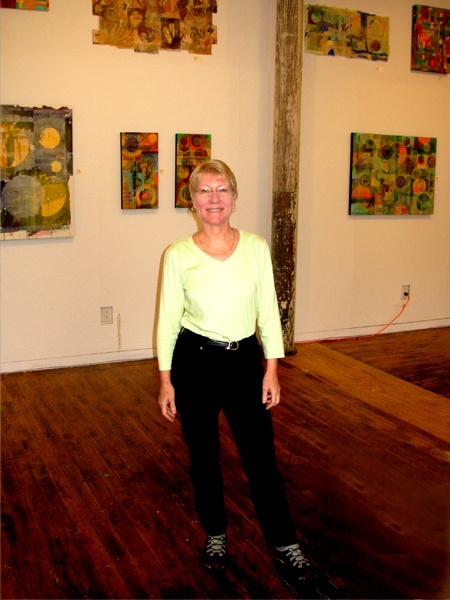 Eclipse artist, Sharon Carson, chaired this year's Open Studios event. 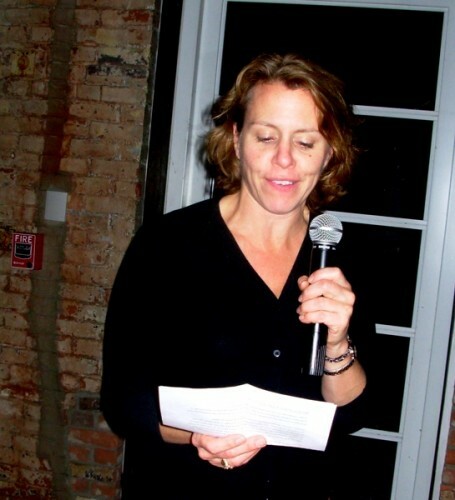 Kathryn Myers, director of marketing for Mass MoCA, greeted the artists. 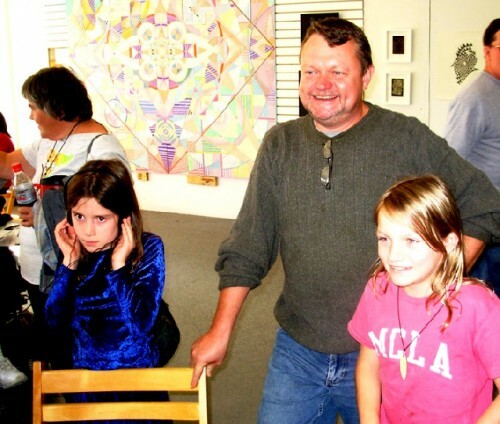 Jonathan Secor with his daughter, right, in the MCLA Annex gallery. 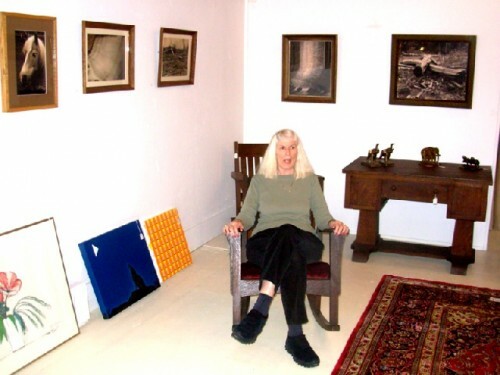 Jane Hudson sits in her exhibition at North Adams Antiques. 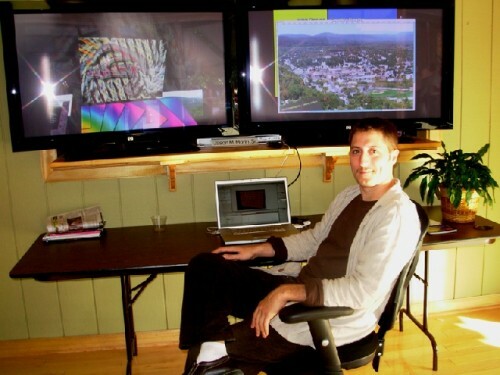 Jason Morin was the web designer for Open Studios here with an animation of the artists. 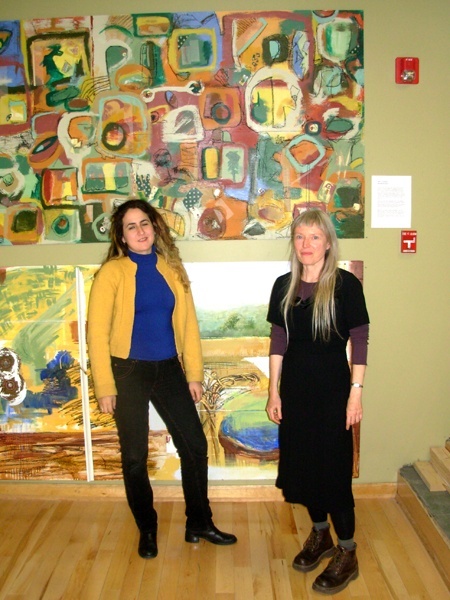 Jaye Fox, left, and Karen Kane with their work in a temporary gallery on Main Street. Work by Howard Cruse, who designed the poster for Open Studios, in a window on Main Street. 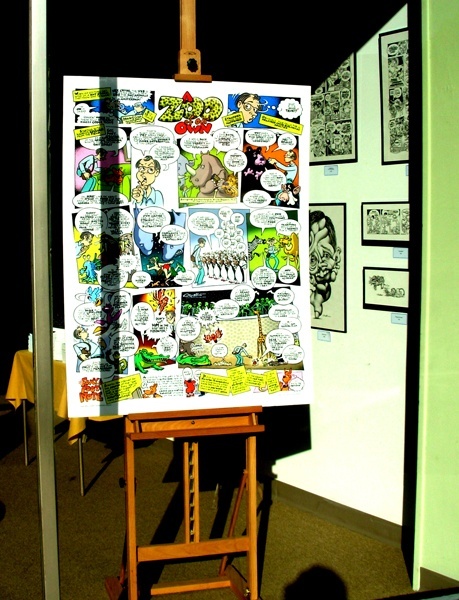 The Eclipse Mill Gallery displays works by its residents. A sculpture by Eric Rudd views visitors to Eagle Street. Debi Pendell in her studio. 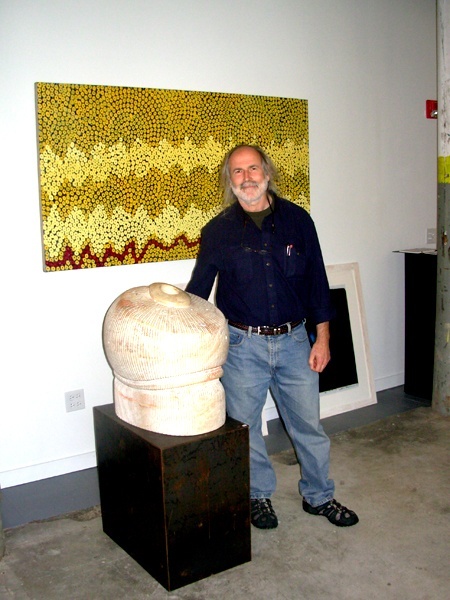 Ralph Brill is showing the sculpture of Jon Isherwood and the paintings of Eve Sonneman. 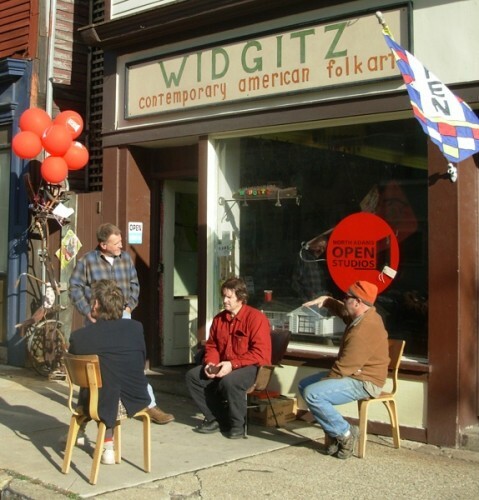 Hanging out at Widgitz on Eagle Street. 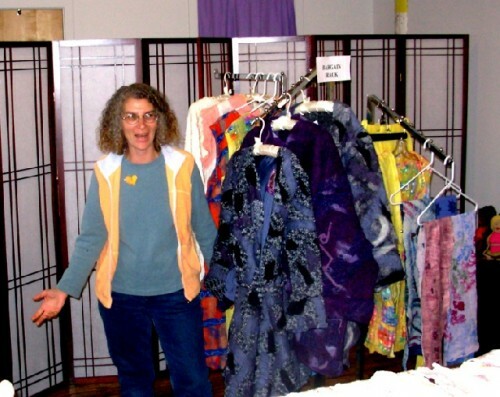 Felt artist Jane Herman with her work. Jennifer Goodhind is showing her photographs at Cup and Saucer. The third annual North Adams Open Studios continues today with work by some 87 artists on view in 23 locations from storefronts on Main, Holden and Eagle Streets, some installed just for this occasion, through the Eclipse, Beaver and Windsor Mills with their dense cluster of artist studios, Mass MoCA, Northern Berkshire Creative Arts in Heritage Park, St. John's Episcopal Church, which is about to be developed as the new home of the long established Contemporary Artists Center, as well as Papyrus Books and the popular hangout Cup and Saucer. For a complete list of artists and venues drop in at any of these participating exhibitions and pick up brochures. Or just hop the Trolley which is making the rounds all day ferrying folks around town as parking is tight at a number of the locations. 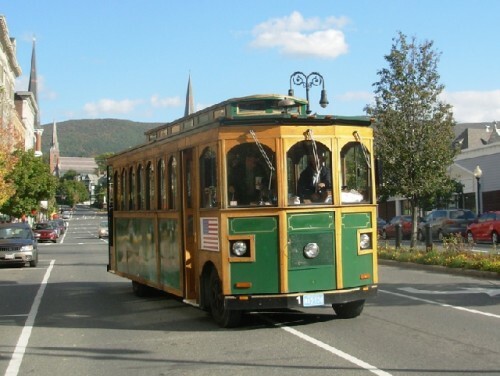 There is plenty of free parking in the Mass MoCA lot and you can pick up the trolley there. This ever expanding popular event started rather modestly when the ceramic artist, Diane Sullivan, and a committee of artists, launched it at the Eclipse Mill Artists Loft complex. It was an enormous effort to get it off the ground. Last year, Jane Hudson, who with her artist husband, Jeff Hudson, runs North Adams Antiques on Main Street, chaired the event which was expanded to Main Street and the other artist loft buildings. 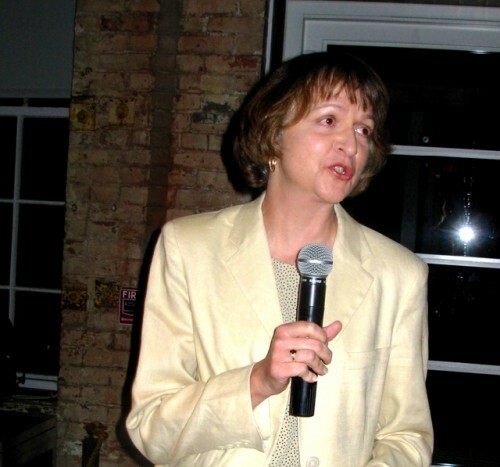 Eclipse artist, Sharon Carson, has chaired this year's event which is the largest and most ambitious to date. The weekend of lively openings and events was launched with a gala reception in the lobby of Mass MoCA. It is particularly significant that the museum has become a full partner in the venture as a positive sign of support for the rapidly growing community of artists in proximity to one of the largest presenters of contemporary art in North America. 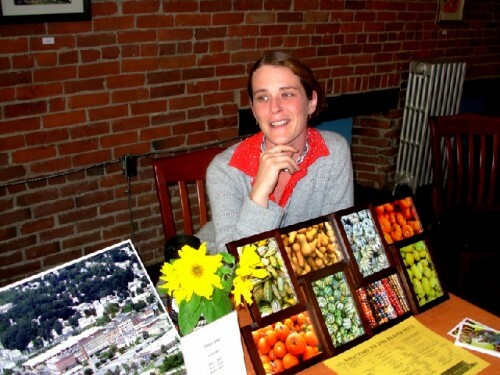 Many of the artists participating in the Open Studios came to North Adams specifically drawn to the synergy of living and working near Mass MoCA. They were also attracted to the potential of affordable housing and large work spaces in abandoned mills of what was once a thriving industrial city. During the opening festivities at Mass MoCA, while artists nibbled on food generously provided by the restaurants, Red Sauce, and Lickety Split, Jonathan Secor the director of the arts programming for the Massachusetts College of Liberal Arts, read a letter from North Adams Mayor, John Barrett 111, who could not attend, in which he congratulated the assembled artists, talked about the hard times for the city some 20 years ago when Mass MoCA was just a concept, and promised good weather for the weekend. Once again, Mayor Barrett delivered on his promise. On behalf of Mass MoCA, the director of marketing, Kathryn Myers, welcomed the many assembled artists. Mark K. Grant the president of MCLA also spoke and affirmed the strong and growing commitment of the college to the fine and performing arts. Sharon Carson had a long list of individuals to thank. These included Howard Cruse, who designed the posters which were displayed all over town, as well as the announcements for the artists' reception. Jason Morin of Media X Productions created the web site which proved to be so popular that on Friday night it was temporarily overwhelmed. The local media was enormously supportive with cover stories in the North Adams Transcript and the Advocate as well as stories in the Berkshire Eagle and Berkshire Living Magazine. Making the rounds of exhibitions yesterday we caught up with Secor in the temporary annex of MCLA's Gallery 51 on Main Street which is currently showing the painting finalists of Massachusetts Cultural Council. He was excited about the turnout and by mid afternoon stated that about 450 people had passed through the gallery and many appeared to be new visitors. There were similar reports when we dropped in on artists in the Eclipse Mill. The really good news is that there were lots of reports of artists making sales from small inexpensive items to large paintings that sold for several thousand dollars. That tends to put a smile on your face. Most individuals spoke positively about the quality as well as the quantity of visitors. For local people and neighbors who make the annual rounds of Open Studios, including families with their kids, this has a way of demystifying just what it is to be an artist. This is a terrific way of making clear to the community how the presence of artists is an important part of the growing economy and marketing of North Adams. Not only do artists improve and occupy abandoned properties and vacant mills but they also pay taxes, send kids to school, and patronize local shops and restaurants. From a critical point of view Open Studios represents an opportunity to view new work. Many artists put considerable effort into getting ready for the annual event. It is exciting to catch up with what a neighbor has been doing. The results can be rather surprising. 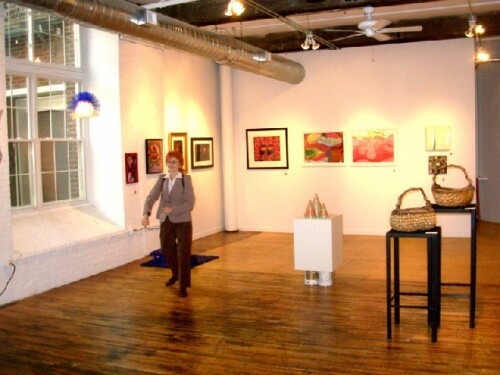 The focal points of the tour of venues were the outstanding exhibitions in the gallery of the Eclipse Mill, featuring artists who reside in the loft building, as well as, the special show "Contemporary Berkshires" at Kolok Gallery. It was poignant to talk with Kurt Kolok as it was the first time he attended a gallery event since he was severely injured and his partner Joe Conway was killed in an automobile accident over Labor Day weekend involving a drunk driver. Last weekend Kurt participated in a MADD March in Boston and raised some $2,500 in memory of Conway. Kurt discussed plans to shut down the gallery for the winter, the current show runs through December, and to spend several months in Argentina. He has shows scheduled for 2008 and intends to honor those commitments. He discussed the enormous love and support he has received from the community during a time of loss and recovery. Like a lot of folks Kurt has pulled his weight in creating a vibrant, diverse and growing arts community. There are the elders around, like Secor who grew up here and was a founding staff member of Mass MoCA, Mayor Barrett, who taught elementary school before jumping into politics, Eric and Barbara Rudd who moved from Washington DC and bought the Beaver Mill later developing the Eclipse Mill. They will tell you what a tough and scrappy town North Adams was way back when. Joe Thompson, director of Mass MoCA, now thriving and expanding, knows how touch and go it was over many years to get the museum up and running. Ask them how far we have come in the past 20 years. And also talk to recently arrived artists and entrepreneurs about their hopes and dreams. It's a vision thing. Artists make things grow. "Hi -- I'm trying to track down Katie Myers who I believe used to work in your area. I can no longer find a residential address for her in Willamstown, and thought perhaps you could tell me where she may have moved. I am an old friend of her mother's. thank you."